Today’s guest post is from adventurer and home canner Heather Francis. She is originally from Nova Scotia, Canada but has lived and worked on the ocean for over a decade. A professional cook who’s worked on both land and sea, these days you’ll find her in the galley of Kate, the Newport 41’ sloop she and her Aussie partner, Steve, have been sailing since 2008. Follow their adventures on Yacht Kate. What I preserve is influenced not only but what produce is in season but by the places that we sail. In Fiji, which has a large Fijian-Indian population, I made batch after batch of mango chutney and mango pickles to accompany the dhal and curry dishes that became dinner staples. 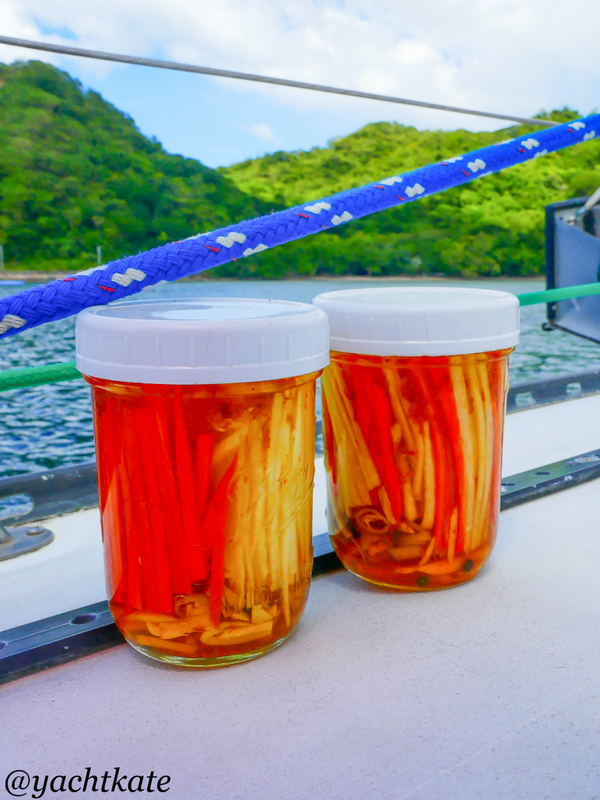 The cool mountains islands and French influence in Vanuatu meant that delicate string beans and fresh dill could usually be found at the municipal food market, so I put up jars of dilly beans. The rich, volcanic soils in Papua New Guinea produced huge, juicy tomatoes that just begged to be made into a sweet relish and a spicy salsa. This year we spent the rainy season in the Philippine Islands in the boatyard doing major engine repairs. Not only did the dark grey skies and heavy rains stunt the tomatoes, they also did not inspire me to spend hours beside the stove when all the hatches were closed. Yet, when the progress on our boat ground to a halt, and stayed that way for several weeks, I yearned to get in the galley and make something. The galley (aka the kitchen on a boat) is always the spot I turn to when my nerves are frayed, and stress levels are on the rise. I know that I have no control over equipment failures or weather patterns, but I find doing little projects in the galley that are easy to complete and yield successful, delicious results are a balm. These tasks keep my hands busy and my mind off the problem. 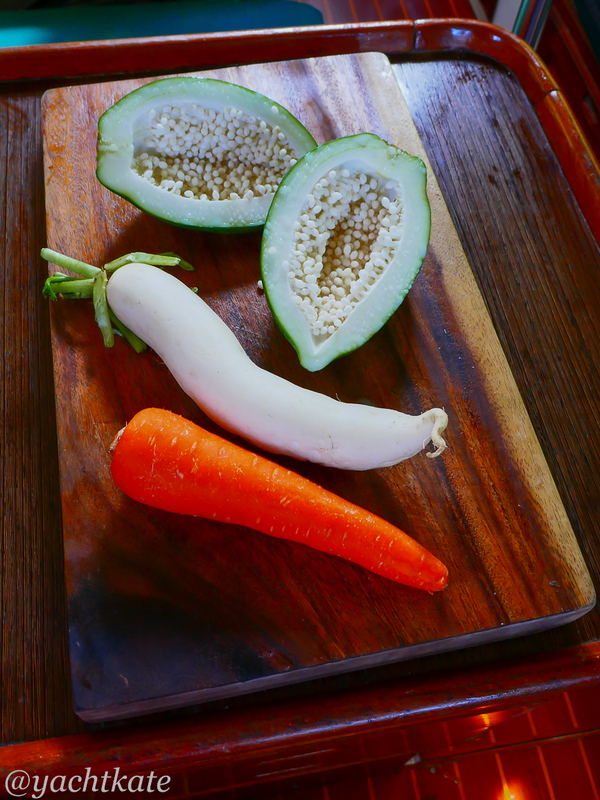 Regulars in the market, even during rainy season, are green papaya, carrots and daikon, a long, white radish. Together with a few of my galley staples – ginger, garlic, turmeric, vinegar, sugar, salt and peppercorns – I knew I had the makings of atchara. Atchara (also achara, atsara) is a sweet-sour pickle that is served as an accompaniment to many Filipino dishes. Like most traditional recipes it has many variations – how the vegetables are cut, the addition of raisins or bell peppers, how sweet or sour it is. It is also similar to pickles of the neighbouring cuisines of Indonesia and Malaysia. 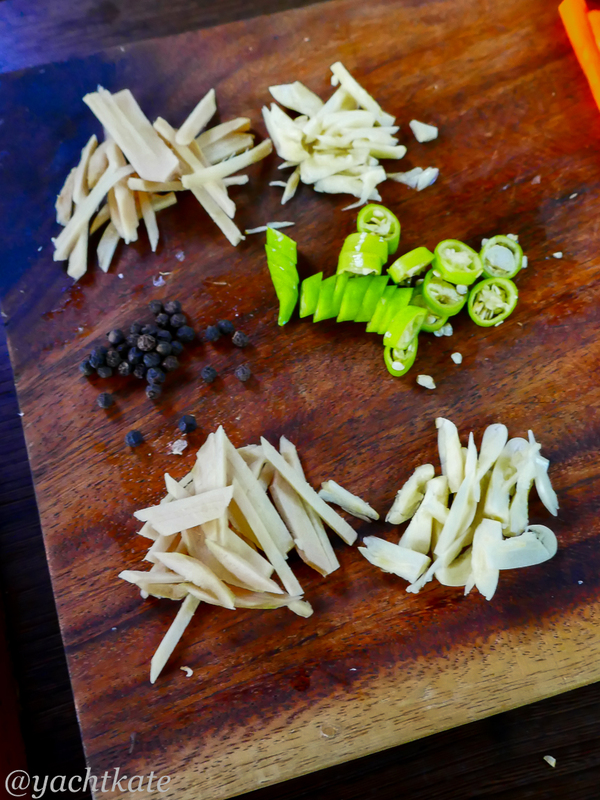 Whatever version you prefer, they all depend on one ingredient; green papaya. 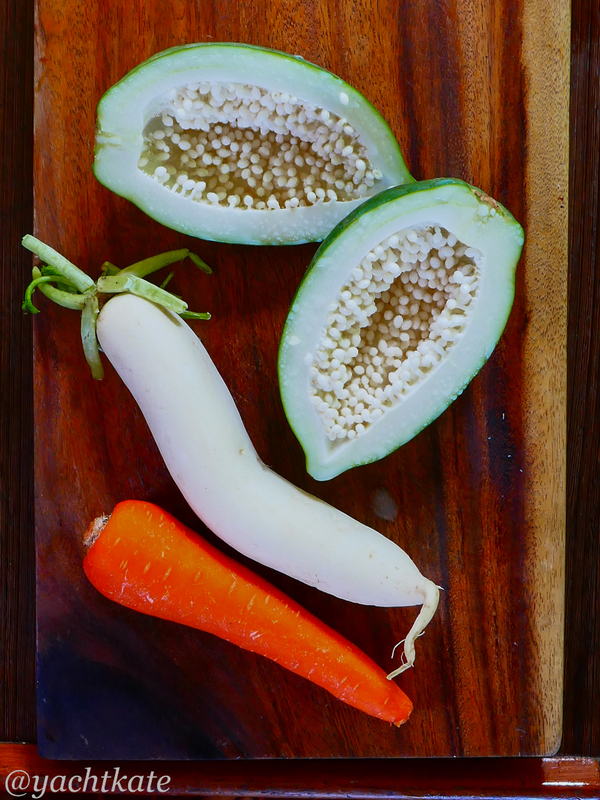 Like cucumber or zucchini green papaya has a neutral flavour but shares the ability to soak up and take on whatever flavours it is prepared with. It also retains its crispness, an important pickle characteristic. Green papaya, especially if it is freshly picked, will exude a white sap when cut that can stain fabrics and, sometimes, irritate skin. If you are sensitive to latex you also might be bothered by papaya sap, so it is advisable to wear gloves. Peeling the papaya under the kitchen faucet also helps. Once all the hard veggies are cut I peel and finely slice a knob of ginger and some cloves of garlic. I like 2-3 cloves of garlic per jar and about the same quantity of sliced ginger. A medium hot chili gets washed and sliced and then everything gets neatly packed into clean ½ quart jars. I add the ginger, garlic and chilis to the bottom of each jar along with a couple peppercorns, then tightly pack in the batons of vegetables. Over the top I grate some fresh turmeric (or fish some out of my gin jar), this way I get maximum flavour and colour with a minimum mess. BE WARNED fresh turmeric will stain anything it touches bright yellow; fingers, cutting boards, plates and small animals. I have seen atchara sold commercially with and without turmeric, so if you don’t have fresh turmeric or do not like the flavour you can omit. I would not advise using ground turmeric as it will not lend the same flavour and will make for a gritty brine and pickle. Into a small sauce pan goes the vinegar, sugar and salt. I use cane vinegar and raw cane sugar as they are found most abundantly in the Philippines. A nice white vinegar or a mild cider vinegar would be a fine substitute. Bring the brine to a gentle boil and stir to dissolve the sugar and salt. Remove from heat and carefully pour the brine in the jars, making sure everything is submerged. All that is left is to screw on a lid. I make these as a refrigerator pickle, but as they are a pickle with a highly acidic brine, they could certainly be water bathed processed and properly sealed. Just know that it will soften the texture. At least a week in the fridge allows for the flavours to develop, a week or two more and the pickles will really start to sing! One thing to know. If papaya is not available a firm cucumber or jicama can be substituted. And if you’re not sure what to do with the other half of the papaya, treat it like a zucchini and add it to your favourite stir fry, curry, casserole or muffin recipe. Cut papaya in half and scrape away the white seeds and membranes. Using a sharp vegetable peeler, remove the green skin. 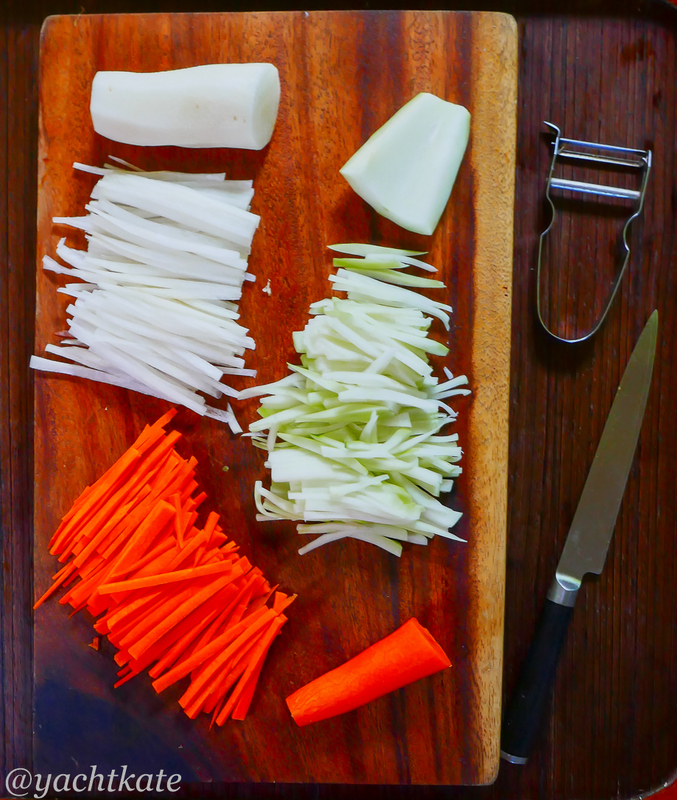 Peel the carrot and daikon. Finely julienne all three, cutting to lengths to fit into your jar. Peel and finely chop ginger and garlic. Slice chili. Place half the ginger, garlic and chili in the bottom of each clean jar. Add 6 peppercorns. 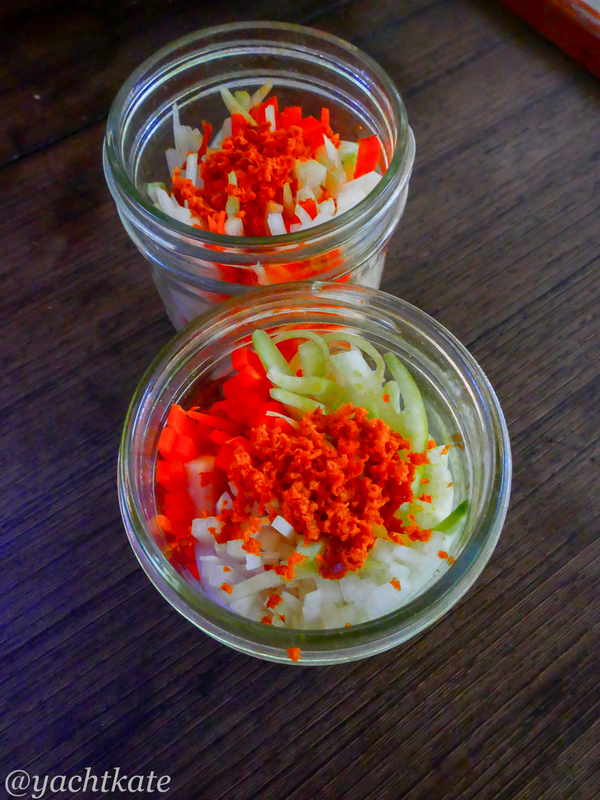 Tightly pack equal amounts of the papaya, carrot and daikon batons in each jar. You can keep them separated or mix them up, depends on your mood. Grate equal amounts turmeric on top of veggies in each jar. In a non-reactive pan over high heat bring vinegar, sugar and salt to a gentle boil, stirring to dissolve. Carefully pour half the brine into each jar, making sure the vegetables are covered. Screw on lid and when cooled, completely refrigerate for 1 week before eating. Most recipes for atchara call for almost a 1:1 ratio of vinegar to sugar, making for a sweet and slightly sour pickle. My preference for pickles leans to the other extreme, I like a sour and slightly sweet pickle, so I have reduced the sugar considerably. This looks great! If I can’t get fresh turmeric root locally, how much of the kind that comes in a jar should I use as substitute? Thanks!